The Pontiff will attend the Global Conference on Human Fraternity at the behest of the UAE’s leadership, that has proclaimed 2019 the “Year of Tolerance”, a move scorned by human rights activists. Along with Saudi Arabia, the UAE is heavily involved in the war in Yemen, dubbed the world’s worst humanitarian crisis, and the country has a problematic human rights record. The UAE has also imposed an air, land, and sea blockade on Qatar, which has severely affected relations among Gulf countries over the past two years. On Tuesday, Pope Francis will deliver a mass to about 135,000 worshippers who were able to get a free ticket to attend the celebration at the Zayed Sports City Stadium in Abu Dhabi. “I thank the friend and dear brother the Grand Imam Sheikh Al Tayyib and those who have organised this meeting for the will and courage to affirm that faith in God unites and does not divide us,” said Pope Francis in a video message to the Emirati people. The dialogue with Islam is one of the main features of Francis’ pontificate, who follows in the path of some of his predecessors. Pope Paul VI made the first pilgrimage to the Holy Land in 1964, and Pope Jean Paul II was the first Pope to set foot in a mosque in 2001. In his six years as Pontiff, Francis has conducted 25 trips abroad, out of which 13 were to Muslim countries. From Turkey to Palestine, Egypt to Jordan, Bangladesh to Central African Republic, the Pope has prayed in the local mosques with their muftis invoking tolerance and peace between worshippers of the two faiths. “This is a historic visit. The first time for a Pope in Arabia is a milestone in the history of relations between Islam and Christianity,” said Orazio La Rocca, a Vatican expert and author, who has covered the Holy Sea for over 30 years. The message the Pope carries to Abu Dhabi is summed up in his video message, said La Rocca. “In Francis’ greeting to Sheikh Al-Tayyib lies the essence of his manifesto. Christians and Muslims are brothers in their faith, and faith never divides. This has been the leitmotiv of his Pontificate since its inception in March 2013,” said La Rocca. The 83-year-old Pontiff, born as Jorge Mario Bergoglio, an Argentinian of Italian descent, is considered by many a progressive, whose forgiving remarks towards unmarried, divorced couples and homosexuals have infuriated the most conservative branches of the Church. 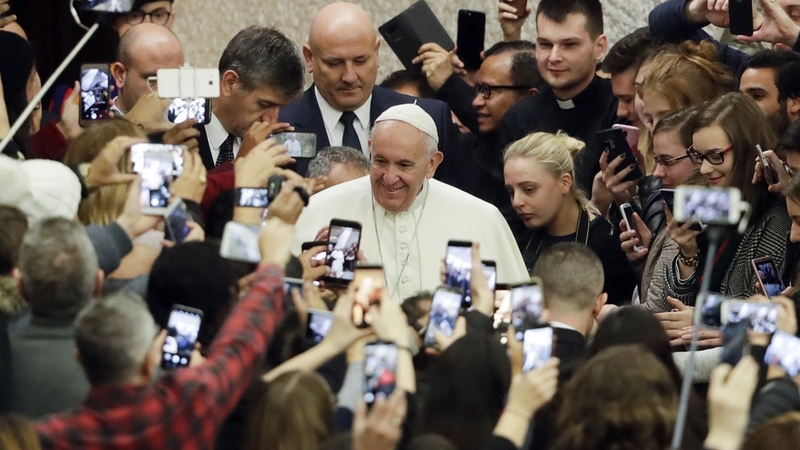 While his supporters say the Pope is just bringing to life the message of the New Testament, his critics have gone to the extent of accusing him of blasphemy. The dialogue with Islam is an issue of contention with his detractors, who have attacked his staunch rejection of any association between religion and terrorism. “The ultraconservative factions especially across the Atlantic are sponsored by lobbies within the Church who abhor not only dialogue with Islam but even with other Christian confessions,” said La Rocca. According to Father Bernardo Cervellera, director of Asia News, Gulf countries like the UAE, Qatar, Oman where Christians flock from around the world to live and work, show that coexistence between Islam and Christianity in a modern Muslim society is possible. Asked whether Muslims and Christians can have a fruitful dialogue nowadays and counter extreme thinking on both sides, Sheikh Ali Al Qaradaghi, Secretary General of the International Union of Muslim Scholars told Al Jazeera that dialogue is a necessity. “The visit of Pope Francis is a positive thing if it leads to a constructive exchange between the two faiths and some tangible outcomes,” said Al Qaradaghi. The Emirates have dubbed 2019, the Year of Tolerance, to mark the legacy of the late President Sheikh Zayed Al Nahyan, the founding father of the country. But today the country is involved in one of the worst conflicts of our time in neighbouring Yemen, where 18 million people are on the brink of famine. At least one million Christian live in the UAE today where the late Bishop Bernardo Gremoli for over three decades has led to the inauguration of some 13 churches across the country, in addition to churches in Qatar, Oman and Bahrain. Christians in the Gulf countries amount to approximately 4 million, but they are mainly economic migrants from different nationalities and ethnic groups, who stay in the region for a limited amount of time due to tight restrictions on residency. In the rest of the region, numbers of communities of indigenous Christians, whose presence dates back to centuries, are in decline. The visit of Francis to the Gulf comes at a time of distress for Christians in the Middle East. A million Christian Chaldeans have fled Iraq and out of half a million Armenian Catholics only 50,000 still remain in the Near East. Syrian Orthodox and Catholics have also thinned along with other minority communities such as Yazidis and Shias.